My connection with Bermuda began when I lived in Boston with my family. I was then a young Lead Engineer working in a large IT company. I had done my engineering in Computer Science from Indian Institute of Technology (IIT), and later went on to become an IT management professional. And as my career progressed, I took up challenging leadership roles at a relatively young age. So you must be already wondering what the heck is this guy doing with travel destination websites such as this one? Well, all I can say - life can change, and change forever, as it did for me. I always loved to see places, meet people, experience new cultures. Sometimes the thought of travel writing passed my mind. But such thoughts were quickly buried by the mammoth load of corporate life. Once we made a leisure trip to Bermuda. And that visit actually seeded the root of our long term love with the island. With time, Bermuda became a favorite vacation destination. Time passed. I was beginning to feel the 'Travel Writer' within me surging out more often than before and pushing me to take a re-look at life. I wrote travelogues in my free time to unwind and de-stress myself. By the next several years, I had seen much of the corporate world already as I performed senior leadership roles in giant global companies. But the sense of detachment only continued to grow. And eventually the time came when I was on the crossroads to choose between the two worlds: an established corporate life or a rising passion? It was a scary time. It could easily mean turning the apple cart upside down. But I am glad that despite many odds, I chose to pursue my passion, was finally able to snap the ties with corporate profession and became a full-time travel writer. So now you know how I became a travel writer and why the topic 'Bermuda' to start my new life. Despite a sea change in our lives, our family vacationing ways haven't changed much. I now live in Kolkata, India. Every time we visit the US or the UK, we continue to make onward trips to Bermuda. Such has been the influence of the island and its people on our family. When I was naming this website, repeatedly a thought came to my mind - the way the island Bermuda and its attractions kept influencing my vision towards life and finally bringing about a permanent change. And gradually the choice of the website's name became an obvious one - 'Bermuda Attractions'. While I've been doing full time travel writing for the past several years, my main intent in this website is to keep posting our Bermuda experiences, findings and stories so that the site by itself becomes a living memory. This website is much more than just a travel matter to us. We have made many friends in the island some of who are artists, dive experts, hotel staff, store owners, guides and even taxi drivers. Many tour operators and outfitters keep writing to me. I also keep getting notes from readers of my website telling me about their own experiences in Bermuda. And many readers write to me seeking tips to help plan their vacation. To us, this website has indeed become a living memory. I have written well over 1,200 pages in this website which you can try to reach through a maze of links. That will require some energy and patience though. I continue to add and update pages regularly. 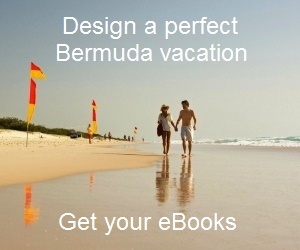 I have also created the Ebooks to help plan great Bermuda vacations. You can perhaps imagine the kind of effort and time I have been putting in to build this living information warehouse.